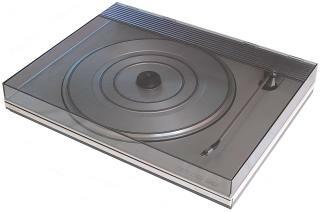 The matching turntable for Beomaster 2000. It was derived directly from the Beogram 1800, and looks very similar. Differences are limited to an MMC 4 pickup replacing the MMC 5, a repeat button and indicator added to the buttons on the deck, a new signal lead with a 7 pin Datalink plug and of course ‘Beogram 2000’ screen-printed on the front. Text copyright © Beocentral. Unauthorised reproduction prohibited. Beogram 2000 was only suggested for use with Beomaster 2000, though it also matched Beomaster 3000 as well, and could be operated with Terminal 3000 via this machine. Text copyright © Beocentral. Unauthorised reproduction prohibited.